The better fed your alpacas, the happier they’ll be. They’re 100% herbivore, only eat plants and love grass, which forms the bulk of their naturally-occurring diet. They also also enjoy roughage-rich leaves, wood, bark and stems, which they digest with ease thanks to their three-chambered stomach, very like cattle and sheep. Because alpacas evolved in harsh conditions they use food energy extremely efficiently, much more so than their lowland-living relatives. The problem is, British grasses and vegetation don’t contain the right type of nutrients to keep the animals in good condition, which is where proprietary concentrates come in, specially formulated for their welfare. They also benefit from plant material with long fibres, like hay. If you need to change an alpaca’s diet, do it gradually. The microbes in their gut need a couple of weeks to adjust to feed changes. Good breeders give their herd a specially formulated alpaca concentrate rich in the nutrients the creatures need for good health. These products are specifically made for camelids like alpacas, full of essential extra vitamins and minerals. 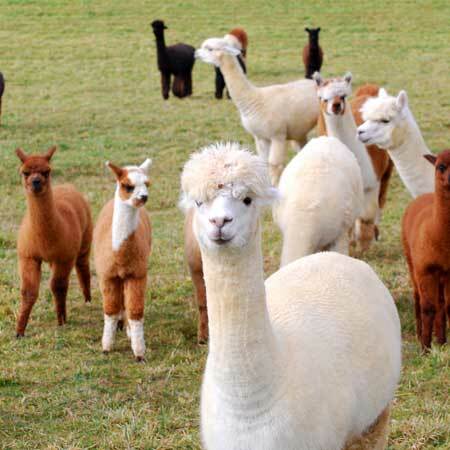 There are several commercial alpaca mixes on the market, and it’s best to use them as a vitamin and mineral supplement on top of natural grazing. Alpacas respond well to treats. They particularly love carrots, apples, broccoli stalks and turnips. But you need to cut the fruit and vegetables into small pieces to stop the animals from choking. Mineral licks are popular with people who farm cattle and sheep, but alpacas don’t tend to like regular mineral licks, preferring to drink the water from a lick in a bucket. In our experience pregnant females and mothers adore sugar beet shreds, which seem to help them produce plenty of milk for their young. In fact all alpacas seem to enjoy sugar beet shreds. Combined with plenty of haylage in bad weather, the resulting full tummies help them stay warm in winter. Alpacas can easily get dehydrated, especially when it’s windy and dry, so they need a constant supply of fresh water. In frosty weather you’ll need to break the ice regularly so they can drink freely. Some alpacas won’t drink freezing cold water. Adding a couple of buckets of hot water to the trough warms it up enough for them, as well as keeping it from freezing again too quickly. As the proud owners of a small but supremely healthy and happy herd of alpacas, we’re always happy to help our fellow alpaca owners with advice and support. Just get in touch.